Over the last few years I've been blessed to be able to have a steady job and move from city to city. Most of you know I've been living in Dallas for the last year and a half. Working in retail I have had quite a hectic schedule. I love my job, but I have always felt God pulling on my heart to serve in another way despite my crazy schedule. The Lord has laid on my heart to start getting involved with organizations in what ever way I can. I would LOVE for you to help me in this adventure of rasing money to help build a well over in Uganda. I chose Uganda because it is a country that was placed on my heart back in 2009. I had once had an opportunity to go an ended up not. I still want to make a difference even if I can't visit anytime soon. Uganda has enough clean water to support everyone in the country, but has no way of getting it to villages in more rural areas. 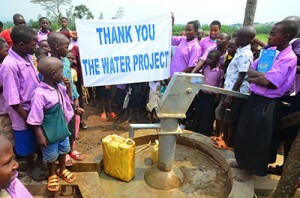 This funraiser will help continue to bring clean water wells to them. Roughly 1 billion people in the world don't have access to clean water. Something that I have taken advantage of throughout my life on a daily basis. So much so that for awhile I would only drink bottled water. I am asking you to help me! For 2 weeks take the water challenge. I plan on starting myself the second weekend in Sept. If you live near me I'm getting a starter kit with bracelets to help remind me. Anytime you want to buy a bottle of water or drink something other than water think twice. And the moeny that you would have used, donate instead to someone else who doesn't have the option of going to a sink! I'm excited to see what can happen when a few people decide to get involved. I dont' have a timeline of when I want to reach it. I have a lofty goal of $2000, but with God all things are possible. As a believer and follower of Christ I believe it is my responsibility to love others as Christ did. Christ had a heart for the poor and the opressed and to help provide for them. He has blessed me with so much and there are some that have very little. I want to make a difference in His name as my savior. If you are unable to financially help I ask for your prayers that he would see his will be done. And that their voices would be heard in Uganda.